What is a Degree in Liberal Arts? WHAT ARE THE BEST ONLINE BACHELOR'S IN LIBERAL ARTS PROGRAMS? What Can I Expect From an Online Bachelor's in Liberal Arts Program? According to a report by the National Association of Colleges and Employers, those with a bachelor's degree in the liberal arts earn -- on average -- more than $50,000 per year. An online bachelor's in liberal arts is preparation for a variety of exciting fields and a growing number of fulfilling careers. Today's employers desire skilled graduates of liberal arts programs, and a bachelor's in liberal arts is a highly marketable degree in today's changing job market. A liberal arts degree is an excellent multidisciplinary education that develops strong foundations in a variety of different disciplines. The field offers a well-rounded education in the sciences, arts, and humanities, and emphasizes critical thinking and writing throughout. While some colleges and universities are designed as liberal arts institutions, general liberal arts degrees can be found at just about any college or university. The multi-faceted design of a liberal arts degree introduces students to a range of coursework, like earth sciences, art history, philosophy, and literature. Many colleges allow a tailored design in their liberal arts degree program. Students can customize their undergraduate coursework toward their specific interests and career goals, and the interdisciplinary nature of a liberal arts bachelor's degree prepares students for the workforce, graduate school, or to be engaged participants in their community. Students enrolled in the University of Central Florida’s interdisciplinary studies program can choose either a bachelor of science or a bachelor of arts degree. As an online liberal arts program, UCF’s interdisciplinary studies curriculum requires students to complete 15 credits in two different areas of study, a minor, and a cornerstone experience during the first semester and a capstone experience during the final semester. The program offers three start dates throughout the year and does not include in-person requirements. Coursework is offered asynchronously. As students have a great deal of agency in choosing their coursework, graduates’ careers can range from writer, psychologist, journalist, or historian. UCF requires all applicants to submit SAT scores for admission. UCF does not list minimum GPA requirements, although the average weighted GPA of the fall 2017 freshman class was a 4.06. Out-of-state students who enroll in the online program must pay a higher tuition rate than Florida residents. Florida International University lists its online bachelor of arts in interdisciplinary studies program as the school’s “most customizable bachelor’s degree." The 120-credit curriculum is comparable to that of other bachelor’s in liberal arts online degrees. Each student must complete a “cornerstone” -- a major course in the first semester -- in addition to completing a capstone project in their last semester. Other than those two courses, the curriculum is largely self-designed, with students taking at least 30 credits in a chosen major area. FIU delivers program coursework asynchronously. Throughout their time at FIU, each online student works with a “success coach” who provides one-on-one advising. FIU charges out-of-state students a higher per-credit tuition than in-state students. Students may apply for admission in the fall, spring, and summer terms. First-time college applicants should submit SAT or ACT scores and transcripts, while transfer applicants must submit transcripts and test scores if they have fewer than 60 college credits. Adult learners can earn their bachelor of liberal arts through the Extension School at Harvard University, the nation's oldest educational institution and one of the most elite. With campuses in Cambridge and Boston, Harvard University offers this degree exclusively for those who have not yet earned an undergraduate degree. Part-time students have the opportunity to take over 800 courses, including courses like "the culture of capitalism", or "chocolate, culture, and the politics of food". All courses are taught by Harvard professors who help students to think critically and develop an informed world view. Students choose a concentration in humanities, science, or social sciences, following a roadmap to their degree that includes 32 courses (128 credits). Most courses can be taken online; however, a minimum of 16 credits must be taken on the Harvard campus. Before admission, Harvard requires all students take three admission courses to demonstrate their commitment and ability to excel with a B grade or higher. Students apply during their third admission course; Harvard allows up to 64 credits to be transferred. Based in Trenton, New Jersey, Thomas Edison State University has focused on adult education since the school’s inception in 1972. The university’s online bachelor of arts in liberal studies program caters to adults seeking a career change, career advancement, graduate education, or personal development. Over the course of the 120-credit program, students choose either a general liberal studies specialization or a more focused specialization in areas, such as communications, health and wellness, and psychology. The curriculum also includes a capstone. TESU delivers program coursework asynchronously. Applicants must be at least 21 years old and possess either a high school diploma or GED. TESU is also transfer-friendly, as transfers from regionally accredited four-year schools can bring up to 117 credits with them. Community college transfers can bring up to 80 credits. New Jersey residents receive a discounted tuition compared to out-of-state students. Lubbock-based Texas Tech University is the sixth-largest university in the Lone Star State. The school also boasts a strong distance learning department, which offers a bachelor of general studies (BGS) program. The 120-credit curriculum requires students to complete significant coursework in three different academic areas, including two within arts and sciences. Available online courses include English, health professions, mathematics, and history. The program delivers coursework asynchronously, and the curriculum does not include courses that require on-campus work. For admission, applicants must have earned a high school GPA of at least 2.0. The university considers transfer credits on a case-by-case basis. Students must complete at least nine credits in each academic area through Texas Tech coursework. Prospective students should check the school’s state authorization page to ensure that Texas Tech’s online liberal studies degree is available in their area. The University of Oklahoma in Norman utilizes a classic liberal studies framework for its bachelor of arts in liberal studies program. The diversified, 126-hour program exposes students to the humanities, natural sciences, and social sciences in a 100% online or hybrid format. Students will explore ecology and evolution, human arrangements, and humanities of the modern and ancient worlds, to name a few topics. General education requirements include 12 to 40 hours with another 42 hours for degree completion. Free electives may account for up to 72 hours. At least 40 hours of advanced coursework must be completed with a minimum 2.0 GPA. Intensive, fast-paced courses follow an accelerated eight-week format with the option for 100% online courses or classes that meet on-site evenings or weekends. Students typically enroll in four courses each semester. With input from their advisers, some may opt for six courses per semester. The program can be finished in as quickly as 18 months, but most finish in two or three years. Admission decisions for the online liberal arts program are made five times a year in fall, spring, and summer. Applicants will need to include a non-refundable $40 fee with their application, plus transcripts. As of fall 2016, CSUN was the largest branch of the California State University system in terms of student enrollment. The school also maintains an array of distance education offerings, including a bachelor of arts in liberal studies degree completion program. Catering to working adults, the program admits students who have completed at least 60 college credits with a minimum GPA of 2.0. Once accepted, students complete an additional 60 credits -- or 20 courses -- in fields across the liberal arts, including English, mathematics, business, philosophy, and history. Students progress through select courses with a cohort of peers. Coursework takes place asynchronously. Each online student is paired with an academic advisor, and CSUN’s online liberal arts degree currently boasts a graduation rate of 85%. CSUN charges each online student the same per-credit tuition regardless of where they live. Brandman University in Irvine, California offers an online bachelor of arts program with an emphasis in multiple subjects teaching. The program is offered through a network of 18 regional campuses throughout California and online. The curriculum familiarizes students with subjects most often taught in California elementary schools--language arts, natural sciences, math, art, history, and physical education--and is meant to prepare undergraduates for post-bachelor's degree credential programs. Graduates with this bachelor's in liberal arts degree will be able to put theories of social, emotional, cognitive, and physical development to the test inside the classroom. Subject matter courses include creativity and the visual arts, California history, and student health and safety. The 120-credit program requires 36 credits earned through advanced coursework and at least a 2.0 GPA in all major and minor courses. Applicants need at least 12 transferable undergraduate-level credits, or their equivalent, plus a completed application and transcripts. Denver's Regis University offers serious flexibility for students with limited time available. With accelerated five- and eight-week terms that start six times a year, it's online bachelor of arts in liberal arts program readies students for the workforce with courses in ethical decision-making, logic and reasoning, social group interactions, and effective communications. Each class in this online program parallels classroom courses, with a structured schedule and weekly assignment due dates. Regis University offers another alternative to campus classes in their directed study program, where students wishing to work independently can develop their own eight-week courses with their adviser. Students need 120 credit hours to graduate with 45 credits from general core courses focusing on oral communication, English composition, literature and humanities, global issues, social sciences, math, natural sciences, philosophy, and religious studies; 18 credit hours in research writing, history, philosophy, and ethics; and 9, 21, or 33 credit hours from electives, depending on whether an optional minor and/or specialization is completed. Applications are due two weeks before the six start dates. The application (including its $50 fee) college transcripts or equivalent work experience, and a personal statement are required. Cal State Long Beach is likely the fastest-growing branch of the California State University system in terms of national profile, as the school received over 100,000 applications for the 2018 fall term. That growth has coincided with an expansion of the school’s distance learning department, which now offers an online bachelor of arts in liberal arts (BALA) degree completion program. The 63-credit program caters to working professionals, running on a cohort model that allows students to graduate in two years. Students complete courses in broad areas, such as oral and written communication, global citizenship and cross-disciplinary knowledge, and cultures, values, and beliefs. Each student also compiles a professional portfolio as a capstone. All students seeking their liberal studies online degree at Long Beach State must have already completed at least 72 credits of college coursework with a minimum 2.0 GPA. The program charges each student the same per-term tuition rate. Students enrolled in the bachelor of arts/bachelor of science in liberal arts program at Excelsior College can either forgo a concentration or pursue a concentration in logistics, population health, or professional and technical writing. The non-concentration curriculum consists of 120 credits, 90 of which must be related to the arts and sciences for a BA degree (60 for the BS). Each track delivers coursework asynchronously, and online courses last either eight or 15 weeks each. Excelsior does not list any specific requirements for students who wish to pursue their liberal arts degree online. Once accepted, students gain access to personal academic advising throughout their time at Excelsior. Admissions evaluates transfer credits on a case-by-case basis, generally accepting course credits in which students scored at least a C-. As a private university, Excelsior charges all online students the same base tuition. The school’s campus is located in Albany, New York. Oregon State University in Corvallis offers a bachelor of arts or bachelor of science in liberal studies that is a stepping stone to several career paths, including education, communications, health care, law enforcement, social work and business. The program's "design your own major" feature has over 1,000 online courses in 90 subjects to choose from. The bachelor of arts program draws from humanities, arts, social sciences, and sciences, while the bachelor of science program focuses on scientific, quantitative ways to understand hard sciences. The bachelor of arts program also requires second-year proficiency in a second language, while the bachelor of science program requires a 15-credit block of science, computer science, and quantitative coursework. Both degrees require comparable effort and time, and both require 180 credits to graduate. Together with their advisers, students build detailed programs of study from 18 different disciplines ranging from art and ethnic studies to music and theatre. A writing intensive course is also required. Some degree requirements can be transferred from other schools for this online liberal studies degree, but at least 45 of the last 75 credits must have been earned at Oregon State with a minimum 2.3 major GPA. A bachelor's degree in liberal studies is one of a dozen online bachelor's programs at the University of Illinois at Springfield, which is known for the quality of its online learning programs. This 60-hour degree-completion program is a non-traditional option that allows students to design their own degree requirements. Online liberal arts students choose at least one course each in seven broad subject categories that include: identity, work, nature, institutions, language, heritage, and art. Electives might include individualism and self-reliance in America, European cinema, or expatriate Paris. Graduates of the program need 120 credit hours, which includes seven hours of core courses, 10 hours of Engaged Citizens Common Experience (ECCI), three upper level courses in each of the seven broad categories, and at least 12 liberal studies courses. The ECCI classes cover U.S. communities, global awareness, and engagement experience, the last of which might include service learning or research projects. Finally, students must take a course where they can participate in discussions with prestigious speakers. The University of Illinois at Springfield allows students to transfer up to 90 hours of lower- and upper-level credits from another accredited school. The bachelor of arts in liberal studies program at University of North Carolina at Greensboro is tailored for non-traditional students who want to complete college in their adulthood. The interdisciplinary online degree is highly customizable, allowing students to choose from three tracks. These include professional studies, with courses in business ethics, culture, and conflict; social sciences, with courses like anthropology and economics; and humanities, with half-semester courses on writing or critical thinking. All classes are online, with no scheduled class times. Students need 122 credit hours to graduate with an online liberal arts degree; which can include transfer credits from other schools. Students who enter the program with 60 transfer credits and who take an average of three courses a semester will complete their degree in seven semesters. A 2.5 minimum GPA is required for admission in August or January. Tuition for online undergraduate courses are discounted compared to on-campus courses. Based in Riverside, California Baptist University has styled itself as a liberal arts university since its inception in 1950. The school stays true to its roots by offering an online bachelor of arts in liberal studies program for students who have already completed 24 college credits with at least a 2.0 GPA. In addition to general education courses, the curriculum requires 49 credits of study in liberal arts fields, such as communications, English, history, and political science. As students in the program have a great deal of agency in determining their degree path, each student also selects a concentration. Current options include English, kinesiology, social science, and human development. CBU charges each online student the same per-credit tuition, even if students live outside of California. Most students complete their liberal arts bachelor’s degree online at CBU in 18 months. Aiming for flexibility, CBU delivers program coursework asynchronously through Blackboard. Located in Columbia, South Carolina, USC has expanded its distance learning offerings in recent years and now offers an online bachelor of arts in liberal studies program. Liberal arts jobs are plentiful, as USC’s program allows students to develop universal skills, such as critical thinking and communication. The 120-credit curriculum includes two fields of study: social and behavioral sciences and arts and humanities. Students complete 27 hours in one of those fields in addition to 12 hours of a chosen concentration, which can be in fields as diverse as theatre, Native American studies, and criminology. Each student must also complete a capstone and a course in South Carolina history. USC delivers program coursework asynchronously, and full-time students can complete the program within two years. Courses last either eight or 16 weeks. Based in Tuscaloosa, the University of Alabama offers an online bachelor of science in human environmental studies, ideal for students seeking liberal arts jobs after graduating. Students complete coursework in areas as diverse as entrepreneurship, health, management, and technology throughout the 120-credit program. Alabama provides maximum flexibility in the general studies program. The program delivers coursework asynchronously and accepts applications year round. Students never have to visit campus to complete their degrees. In addition, despite Alabama’s status as a state school, all students in the program pay the same per-credit tuition. Applicants should submit either prior college transcripts that prove they have completed 24 college credits or a high school diploma. Operating out of the nation’s capital, Georgetown’s School of Continuing Studies is notorious for excellence in adult and continuing education. The bachelor of arts in liberal studies program is the school’s broadest offering, requiring students to complete a total of 120 credits. The curriculum largely focuses on the humanities, with students completing coursework across liberal arts fields, such as religion, literature, philosophy, art, and history. Students can enroll full-time and finish in two years, but most students enroll part-time and finish in four. Full-time students take four courses per term, while part-time students take one or two. The program delivers coursework asynchronously. Georgetown accepts students for the online liberal arts program in the spring, summer, and fall terms. Transfer students may apply up to 64 approved credits. Once accepted, all students pay the same per-credit tuition. Northwestern State University of Louisiana is Louisiana's first and largest online campus. One of 39 online degree programs, its bachelor of arts in liberal arts program is centered on the social and behavioral sciences, English, languages, communication, and the creative and performing arts. Program requirements include 12 semester hours in a foreign language, 42 hours of electives, 26 hours in the concentration, and 40 general education hours. Fast track eight-week sessions occur in the fall and spring, where students concentrate on one or two courses at a time. Summer courses follow a three-, five-, or six-week format. Most online courses are a combination of online lectures and reading assignments. Classes may also make use of textbooks, required term papers and essays, and discussion board participation. Online liberal arts degree students may be required to take their midterm and final exams on the Natchitoches campus, unless they opt for a proctored exam at a local testing center. Students are also encouraged to attend commencement ceremonies. Distance learners pay no out-of-state fees but do pay a flat tuition rate. Financial aid is available to all online students. A public university based in Muncie, Indiana, Ball State operates an extensive online department that helps the school serve students outside the borders of the Hoosier State. The school’s bachelor of general studies (BGS) degree completion program accepts both first-time college students and students who have already completed some college coursework. The 120-credit curriculum is highly customizable, with students completing two minors in fields, such as women and gender studies, autism spectrum disorders, and residential property management. The program delivers all coursework asynchronously. Applicants who are 23 and older and have not attended college must have earned a high school GPA of at least 2.5. First-time applicants younger than 22 must submit SAT and ACT scores. Transfer applicants who have completed at least 24 college credits must have earned a GPA of at least 2.0 in those courses. Transfers who do not have 24 credits are subject to first-time applicant requirements. Out-of-state students earning their liberal arts degree online at Ball State pay a higher per-credit tuition than Indiana residents. For a completion degree, ENMU’s bachelor of applied arts and science in liberal arts program accepts only students with an associate degree in applied arts and sciences from a Council for Higher Education-accredited school. The program allows students to pair their previously-earned technical degree with a broader concentration in liberal arts to expand each student’s post-graduate opportunities. As such, the 45-credit program includes a 30-credit liberal arts core, which includes coursework in history, political science, psychology/sociology, and religion, in addition to 15 credits of electives. The university delivers all program coursework asynchronously, and students never need to visit campus in Portales. Students typically finish online liberal arts degree at ENMU in two years of full-time study. ENMU currently does not allow out-of-state students to pay in-state tuition; however, the school offers numerous scholarship opportunities to out-of-state students and transfer students to ameliorate the cost of tuition. Arizona State University -- Skysong offers an online bachelor's in liberal studies, offering diversified coursework in 25 disciplines in the humanities and social sciences. The program helps students develop their capacity for critical and creative thinking, and strengthens their professional career development. The 120-credit program requires at least 45 upper-division hours and a 2.0 GPA or better. Required courses cover computer/statistics/quantitative applications, humanities, arts, design, as well as three awareness courses in cultural diversity, global awareness, and historical awareness. Sample course options include communication in the electronic age and immigration and ethnicity in the United States. Like many online liberal arts programs, some online courses may require scheduled participation for certain assignments, and some assignments or tests may only be available for a limited time, so they must be completed within a designated period. While no campus visits are required, students are encouraged to attend commencement ceremonies on campus. Newly admitted students can begin at Arizona State University on six start dates throughout the year. Many courses start every seven-and-a-half weeks. Classes are regularly offered in the fall, spring and summer terms. An online bachelor's in interdisciplinary liberal arts gives students at Colorado State University (CSU) in Fort Collins a comprehensive education with interdisciplinary coursework in communications, political science, sociology, economics, and the humanities. The first educational institution in the state to offer this kind of degree, CSU designed a 120-credit program where students can also choose a five-year program with dual degrees in liberal arts and engineering science. Students have the choice to select a minor or second major, or earn 21 credits in a language. The choice of minors includes business administration, sociology, anthropology, economics, media studies, political science, and gerontology. The capstone seminar has students read, interpret, and discuss a range of material related to an instructor-assigned topic; students are evaluated based on their writing, research and presentation. Students interested in the liberal arts bachelor's degree online should expect to spend nine to 12 hours a week, per course. The program is designed for those with an associate's degree or 40 or more transferrable credit hours. Currently operating its flagship campus out of Statesboro, GSU extends its reach through numerous distance learning programs. GSU’s online bachelor of interdisciplinary studies program is particularly popular for its flexibility. Catering to transfers, working professionals, and stay-at-home parents, the 126-credit curriculum requires students to complete at least 26 credits in three different areas of study. Possible areas include music, writing, public administration, business, sociology, and criminal justice. GSU delivers all program coursework asynchronously, and students never have to visit campus to complete their online liberal arts degree. The program runs on a cohort model, with students completing a prescribed course sequence with the same peer group. As such, admission is competitive with a limited number of available spaces in each cohort. Freshman applicants must have scored at least a 1010 on the SAT or a 21 on the ACT. GSU is particularly transfer-friendly, as students need only complete 36 credits of GSU coursework. All transfer applicants must have already completed at least 30 college credits with a minimum 2.0 GPA. With the bachelor's in liberal studies program at Iowa State University, there is no traditional major. Students work with their advisers to focus on one or more disciplines to personalize their studies to meet their professional, personal, and educational goals. The 120-credit, online liberal arts degree program requires 46 credits in general courses, and electives comprise 38 credits. At least 12 credits each are required in three of five areas, including humanities, communications and arts, natural sciences and mathematics, social sciences, and professional fields. Three credits of coursework in both U.S. diversity and international perspectives are also required. Up to three-fourths of the degree requirements can be transferred from other institutions. Prospective students need at least a 2.0 GPA, as well as an associates degree before admission. Though these rankings provide a general idea of what to expect from an online degree in liberal arts, note that programs will vary from school to school. Carefully consider each program's online learning platforms, policies, and degree path options before selecting the best online degree in liberal arts for you and your needs. Introduction to Sociology: This course is a broad look at the inner workings of society. As a field, sociology addresses the ways humans interact and the cultures that they form together. This course is an introduction to the broader field of sociology, and the basic sociological ideas and principles. Courses in sociology are good preparation for a career in social services. British and American Literature: Courses in British and American literature cover novels and texts from various time periods, usually from the early 1400's to today. These courses engage many genres of writing, including poetry, novels, and nonfiction essays. Students identify different literary movements and periods, and write critical analysis of literary works. Studying literature may be preparation for a job as a secondary English teacher. Philosophy: The study of philosophy covers topics including the mind and body, religion and spirituality, and the nature of truth. Courses in philosophy call for a great deal of thought and contemplation of different ideas and concepts. The field also engages the historical philosophical tradition, and traces the origin and maturation of theories and concepts. Philosophy provides a better understanding of the world, and is a common field for those intending to pursue a law degree. HOW LONG DOES IT TAKE TO GET AN ONLINE BACHELOR'S IN LIBERAL ARTS? A typical bachelor's degree requires the completion of 120 credit hours of coursework. For a traditional, full-time student, this may take up to four years. Students may be able to complete their online degree in liberal arts program in less time, depending on how many hours one takes per semester, and whether summer classes are available. The length of time it will take to complete an online degree program in liberal arts can vary widely due to a number of factors. For example, a cohort-directed program that keeps students together throughout a program may require more time to complete; an individually paced program allows students to work at the pace that suits them, and may lead to earning a degree more quickly. It is also important to note whether a program is offered asynchronously or synchronously. Each of these will have an affect on the pace at which students complete their required coursework. 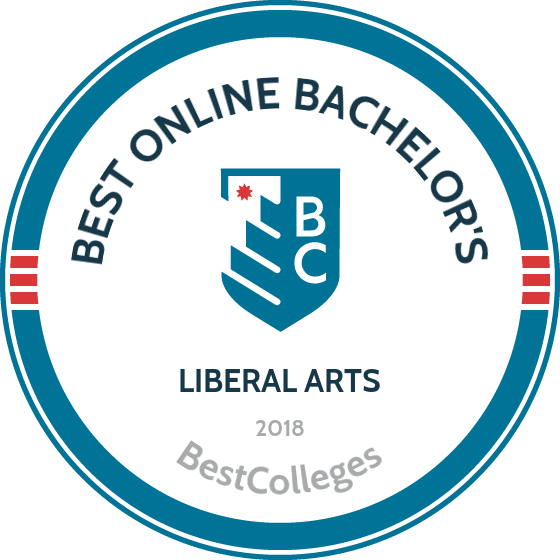 With the available amount of online and on-campus college options available, it may be overwhelming to select the best online bachelor's in liberal arts program for you. One important factor to consider, however, is the kind of accreditation each program holds. Schools are most likely regionally accredited, and some may be nationally accredited, as well. Regional accreditations include the Higher Learning Commission, which accredits schools in 19 north central states that meet its specific criteria. The Council for Higher Education Accreditation is another highly esteemed accrediting agency that provides a comprehensive list of their recognized accredited post-secondary schools on their website. While the U.S. Department of Education is responsible for the policies in the U.S. school system, it also provides aid and assistance to students through a variety of grants and loans. The first step in securing funding for your degree is to submit the Free Application for Federal Student Aid (FAFSA), which determines your eligibility for federal funding. The Department of Education also maintains a database of federally accredited institutions. Graduates of an online bachelor's in liberal arts program generally have a few key advantages over other applicants in the job market. Since the nature of the liberal arts degree is multidimensional, graduates are equipped to handle the interpersonal and critical thinking skills employers look for in their employees. Critical Thinking Critical thinking demonstrates an ability to solve problems while also seeking team-oriented solutions to complex dilemmas. Adaptability A liberal arts degree program prepares graduates to move seamlessly from one area to another. Adaptability is vital in today's ever-changing job market. Communication Nearly every career demands excellent written and verbal communication skills. Graduates of a liberal arts degree program excel in this area, making them more marketable to future employers. According to the U.S. Bureau of Labor Statistics, there are a number of jobs in the liberal arts that offer healthy average salaries. A liberal arts degree prepares graduates to enter a number of quickly growing fields, with generous starting salaries and a potential for advancement. Below, you will find a few examples of average salaries of jobs held by graduates with liberal arts degrees. Liberal arts degree programs are great for people with a wide variety of interests and hobbies, and who want to pursue different fields of study at the same time. Rather than a focus in one area, an online bachelor's in liberal arts exposes students to a number of different majors and minors before choosing a more specific concentration. Graduates of liberal arts programs are highly effective in careers that value teamwork and strong critical and analytical thinking skills. Social workers support vulnerable children and families, and connect them with available and appropriate resources in the community. They create workable plans to provide support for families and individuals in need. An ideal career for those who enjoy planning and coordinating services in their communities, social and community service managers work within their local communities in non-profit organizations and government agencies. Human resource specialists organize hiring and hiring processes for companies and organizations. These specialists are tasked with screening, interviewing, and recruiting prospective employees, and they may also handle day-to-day issues and processes between workers. High school teachers plan and teach lessons in their subject of specialization. A graduate of a liberal arts program has the potential to specialize in just about any high school class subject, from mathematics to social studies. These specialists are often the public face of companies. They work directly with the public to promote a positive image of the company, while raising awareness of an organization's goals and missions. Because a liberal arts degree program exposes students to a broad array of subjects and disciplines, graduates are prepared to work in countless professional organizations and companies. However, the broad scope makes it even more important for students to find specific programs and organizations to help them achieve their career goals and maintain positive and ongoing professional relationships. Below, you will find a few professional organizations in the liberal arts. The CLAC provides a place for people in the liberal arts to connect, share ideas, network, and advocate for one another. This organization also hosts a number of events annually, and provides opportunities for job placement and development. Founded in 1776 at the College of William and Mary, Phi Beta Kappa is a prestigious honor society that focuses on excellence in academics in the liberal arts. Members connect via events and through the organization's website, making it easy to network with others in your chosen field. HERA is a non-profit research and education-based organization that promotes the study of the humanities. The organization is also a charity that accepts donations and works to provide institutions with humanities instruction. There are a number of ways to fund an online bachelor's in liberal arts, including loans and scholarships. The first step to obtaining funding for your undergraduate education is always to complete the Free Application for Federal Student Aid (FAFSA). From there, your school will be able to provide you with more individualized funding opportunities based on your personal needs.